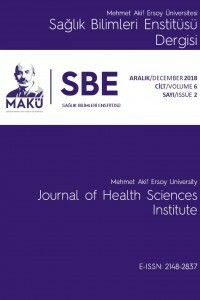 Mehmet Akif Ersoy University Journal of Health Sciences Institute (MAKU J. Health Sci. Inst.) is an international blind peer-reviewed open access journal, published biannually. There is no publication fee. The Journal is dedicated to publishing original research articles, review articles, case reports, short communications and letters to the editor in the fields of veterinary medicine, health science, animal science and biology. The publication language of the journal is Turkish and English. This Journal is indexed and abstracted by DOAJ, Google Scholar, SciLit, Researchbib, SOBIAD, Turkish Citiation Index. It is necessary to submit with the ORCID ID number of each author in the articles to be submitted to the journal system. All scientific responsibility of the articles belongs to the authors. The authors of the submitted article must have a specific contribution to the work. Authors' name ordering should be a joint decision. Corresponding author is considered to accept the author sorting by filling in "Author Responsibility and Publication Transfer Form" on behalf of all authors. All of the authors should be listed under the title of article. The authors are responsible for their compliance with the ethical rules. In experimental studies on animals, it should be noted that the study protocol has been approved by the animal experiment ethics committee at the institution where the study was conducted. Authors should submit the ethics committee's approval with the article. If there are previously published text, tables, pictures, etc. in the article, the authors have to get written permission from the copyright holder and the authors should specify and indicate the used material in the manuscript. In the course of the manuscript evaluation, the authors may be requested to submit the research data and / or the ethics committee approval document if deemed necessary.